Sawmill operators Ernest (1903-1984) and Oscar (1898-) Lamming moved to the Robson Valley in 1943. At its peak of production, around 1960, their mill shipped about 10 million board feet of lumber a year. Many of the 80-man crew lived in the nearby townsite, which grew to a population of about 250. It had its own school, church, post office (open from 1945 to 1969), community hall, and company store. Ever since they were boys in Sault St. Marie, Ontario, the Lamming brothers had worked in their father’s sawmill. In 1934 they started their own mill at Rocky Mountain House, Alberta. When timber became scarce, they were attracted to the Robson Valley by Adrian Monroe, who wanted to sell the logs and timber that remained after his mill burned down. Until 1946, a portable mill was used at various locations. In 1945 a new mill was started at Mile 5.4, with a six-car siding. The Canadian National Railway agent called the siding Lamming Mills in imitation of other mill towns. At one time, the brothers had three sawmills operating, at Dome Creek, Lamco Road, and Lamming Mills. Ernie worked at the sawmill until it closed in 1966, and for three years after ran a small mill next to Zeidler’s. 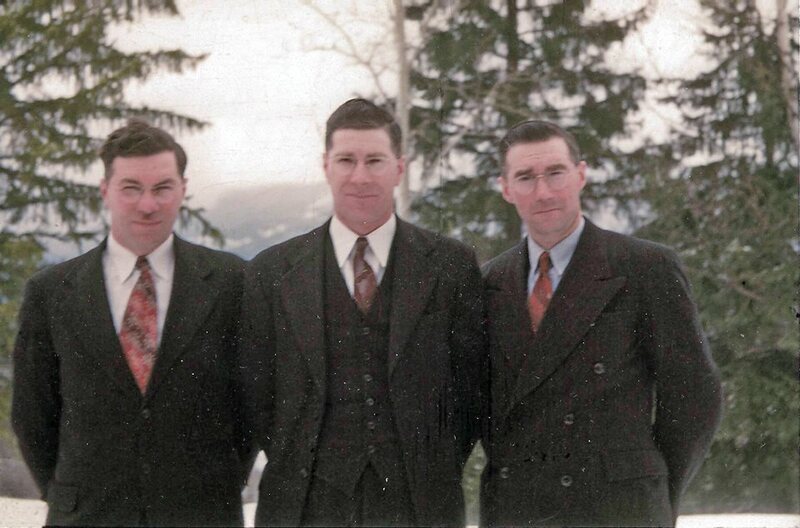 In addition to the sawmills, Ernie and Oscar ran a hardware store, built and ran the Alpine Cafe (destroyed by fire), started the Lamming Garage (now the Village Esso), operated the LSL (Lamming-Stanley-Lamming) Construction Company, and ran a dairy that delivered pasteurized milk as far as Valemount. Ernie’s wife Wilma was in charge of all the office work, having in the 1950s six sets of books to keep. Oscar’s wife Nellie ran the store for years, and later was postmistress. Ernie was chairman of the McBride and District Hospital Board for several years, and was instrumental in the construction of the new hospital. He was long-time chairman of the local school board. For several years after his retirement, Ernie and Wilma spent winters in the Bahamas, where Ernie managed a real estate project. After a serious automobile accident in 1979, they returned to Canada and spent the winters in the Okanagan or on Vancouver Island. Ernie died in Kelowna after a sudden illness. Oscar had received a degree in taxidermy in 1917, but it was not until 1950 that he was able to pursue his hobby. He completed his first small museum at Lamming Mills as a Centennial Project in 1958. When he retired from logging in 1963, he built Oscar’s Wildlife Museum near the Doré River, on a site that was then on the highway. In 1986 he was living at Winfield, B.C. Lammings built the building first as the hardware store and then changed it to the Alpine Café. Melvin McCarty (my Dad) managed the store for a few years in the early ’50s. I remember him bringing home a little record player and some 45rpm records, “How Much Is That Doggie In the Window”, etc. Oscar Lamming was my Grandfather and I spent my early years helping him do his taxidermy work. I also went out on the trapline with him several times to collect the animals he caught. He died at 93 years in Winfield. He and his brother Gordon were getting ready to go out on Okanagan Lake to fish when he died suddenly. My name is Travis Lamming. Gordon Lamming is my grandpa. My father Gerald Lamming is my father. On Saturday July 29, 2017, myself, my dad and my brother Evan will going to McBride to have a look around. Maybe try and see what’s left of Lamming Mill’s.